I used Soft Sky with my stamped flowers from the Something to Say set and I used the Hello You thinlit set for the sentiment. I layered it with three layers of card stock and topped it with Crystal Effects (I know, I’m hooked). I made a boo boo, I thought that the DSP was in the Occasions catalog. I certainly wish that it were. It is fun to play with! I also used some Basic Gray candy dots on the flower centers. I’d love to see what you can do with this color challenge, come and play along here! Tagged Bridgette Jones, Candy Dots, Crystal Effects, Hello You Thinlit Die, Stampin' Up! Oh! I love Soft Sky…sorry you struggle with it! Love the flowers and the CAS design! Great job with the color challenge this week! We all have our certain colors that we struggle with…mine seem to be in the purple family. I always struggle with it! You’ve added just the right amount of Soft Sky in the the flowers….they look very pretty! Such a pretty card! I love that DSP too and I’m hoping there will be some sort of embossed DSP in the new catalogue that we can play with. 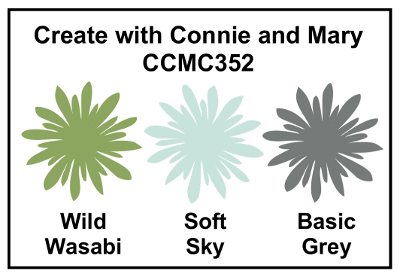 I love your card – the Wild Wasabi looks great and the soft accent of the Soft Sky flowers is perfect. Soft Sky is not a color I reach for either, not that I dislike it, I think I just like the other blues better. You have used just the right amount of it LOL! I love how you did your thinlit “hello” with layers and Crystal Effects. Very pretty card! I love Soft Sky but there are plenty of others I feel the same way about – Always Artichoke is one I never reach for! You did the sensible thing and used the blue as an accent only. 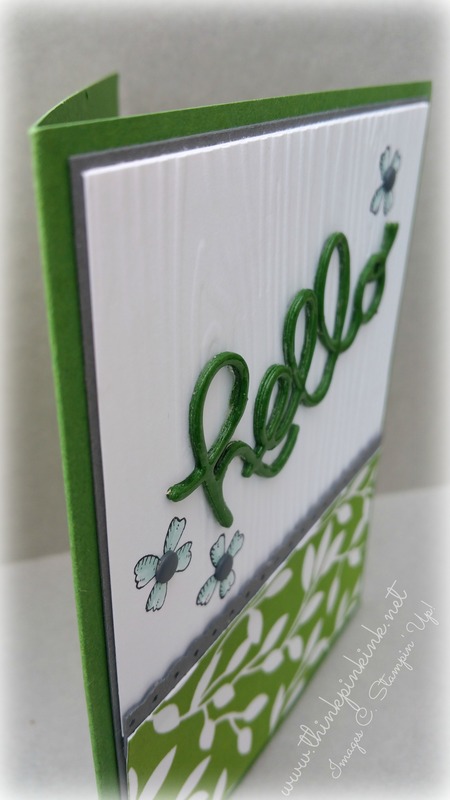 I love the fresh zingy feel of this card from the greens and I’m sooo hoping we see more of this embossed DSP too! Great card Bridgette! 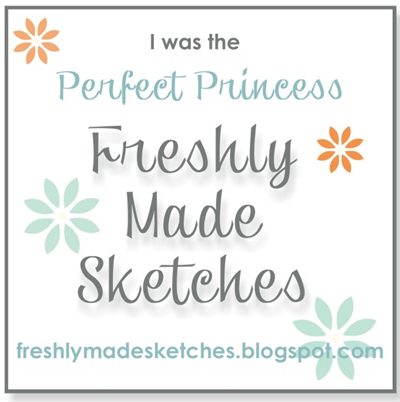 I love Soft Sky and let it take center stage on my card…it’s the greens I have really trouble with…I’m not a fan of green! This is a great card…very happy! Sure to make anyone’s day! 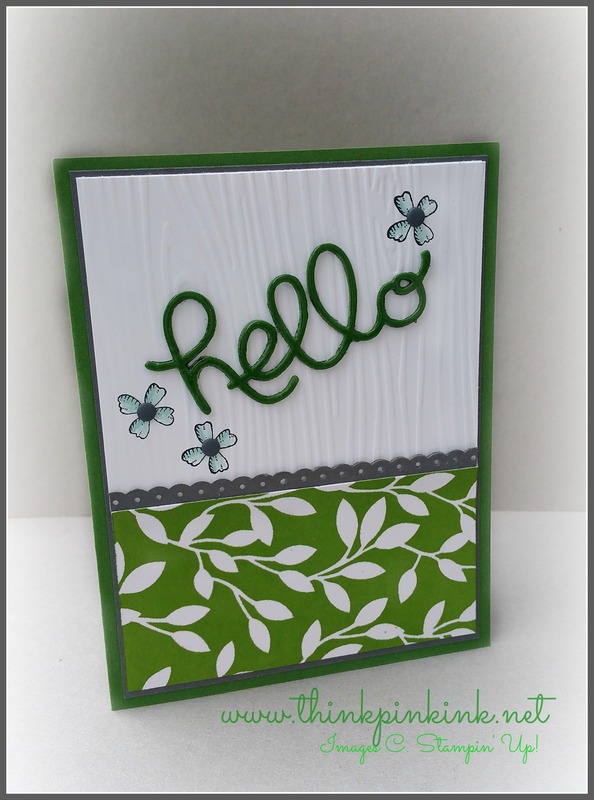 You created such a pretty card with these colors; love the fresh feel with all the green and leaf design. The sweet blue flowers are a lovely accent. Don’t feel bad, we all have colors that we are not naturally drawn to…and I cringe when I see them used for our color challenges, lol!